The Nantucket Historic Association preserves and interprets the history of Nantucket Island and fosters an appreciation of its historic significance. In this section, you will find information on the Nantucket Whaling Museum, the Hadwen House, the Oldest House, the Old Mill, the Greater Light, and the Quaker Meetinghouse. The candle factory was built by the Mitchell family immediately following Nantucket`s Great Fire in 1846 and close to the end of the island`s whaling era. Less than two years later, island businessmen William Hadwen and Nathaniel Barney purchased the manufactory and continued to operate it as a candleworks until the end of whaling in the 1860s. The structure served as a warehouse until its conversion into the offices of the New England Steamship Company in the 1870s. In 1919, the candleworks was outfitted to use as storage and housed an antiques shop. In 1929, the building was purchased and converted into the NHA`s Whaling Museum, and remained as such for more than seventy years. Restored in 2005, the Nantucket Whaling Museum features a restored 1847 candle factory, expanded top-quality exhibition space, a fully accessible rooftop observation deck overlooking Nantucket harbor, and the sperm whale skeleton. In 2008, the whaling museum received accreditation from the American Association of Museums, an honor bestowed upon fewer than one of every twenty-two museums in the country. The Hadwen House is a Greek Revival mansion built in 1845 by whaling merchant and silver retailer William Hadwen. Hadwen purchased the property on the corner of Pleasant and Main in 1844, and commissioned local builder Frederick Brown Coleman, "an artisan who specialized in intricate carvings and designs for pillars," to construct the two-and-a-half storied clapboard house with a five-bayed fa�ade, colossal pilasters, and a pedimented ionic portico. The building and its twin Greek Revival mansion at 94 Main Street were the most ostentatious private dwellings the island had ever seen, and a symbol of the wealth and prosperity of the island`s leading citizens. The first floor parlors display the opulent furnishings and grand lifestyle that had come to replace the island`s once dominant sober Quaker aesthetic. The imposing structure was donated to the Nantucket Historical Association in 1965 by Jean Satler Williams. Visitors are also invited to enjoy the ground`s Victorian gardens, which are carefully maintained by the Nantucket Garden Club. Also called the Jethro Coffin House, this is the oldest residence on Nantucket. Built as a wedding gift in 1686 for Jethro Coffin and Mary Gardner, it is the sole surviving structure from the island`s original seventeenth-century English settlement. Jethro Coffin, who is listed as a blacksmith at the time of his death in 1727, was the grandson of one of the island`s first white settlers and original proprietors, Tristram Coffin. Coffin sold the house in 1708 to island weaver Nathaniel Paddack. From the Paddack family, it passed into the hands of George Turner, a cooper, in the 1840s. Turner later abandoned the building during the depressed years of the Civil War. The Coffin Family Reunion of 1881 led to renewed interest in preservation and restoration of the structure. 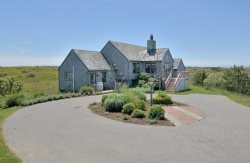 The Nantucket Historical Association acquired the house in 1923, and conducted a reconstruction of the original settlement in partnership with the Society for the Preservation of New England Antiquities (SPNEA, now called Historic New England). In 1987, the Oldest House was struck by lightning, and underwent restoration under the guidance of John Milner Architects, Inc. It stands today as a monument to the lives of the island`s earliest settlers. Built in 1746 by Nathan Wilbur, a Nantucket sailor who had spent time in Holland, the "Old Mill" is the oldest functioning mill in the country. It is the only surviving mill of the four "smock mills" that once stood overlooking Nantucket town. There was a fifth Nantucket mill called "Round-Top Mill" on the site of the present New North Cemetery. Smock mills have a fixed body containing machinery and a cap that turns to face the sails into the wind. The Old Mill was sold for twenty dollars in 1828 to Jared Gardner in deplorable condition for use as "firewood." Instead of dismantling it, Gardner, a carpenter by trade, restored the mill to working condition capable of grinding corn. The mill was sold once again in 1866 to John Francis Sylvia, a Portuguese miller of Azorean descent, who operated it for many years with his assistant Peter Hoy until it fell into disuse in 1892. In 1897 Miss Caroline French purchased the mill at an auction for $850 and donated it to the Nantucket Historical Association. Its very name elicits the spirit of the summer colony of artists that arose on Nantucket in the 1920s. Gertrude and Hanna Monaghan were among them, drawn from Philadelphia to this "faraway island in the sea" in search of a studio in which to paint and write. With their Quaker belief in the Inner Light guiding them, the Monaghan sisters lovingly transformed an eighteenth-century livestock ham into a remarkable summer home, aptly naming it Greater Light. Art, the Monaghans believed, was an expression of the Inner Light, and so they embellished their home with architectural flourishes that included gilded pillars and massive iron gates, an eclectic collection of furnishings and art, and a garden with a small fountain. In her book, Greater Light on Nantucket, Hanna provides a compelling, and often humorous, account of how she and Gertrude set about renovating the property from 1929 to 1933. The book has been reprinted and is available at the Museum Shop. Tucked away at 8 Howard Street, Greater Light provided the Monaghans with a cultural haven where they and their friends enjoyed musicales, theatrical performances, poetry readings, and art. In particular, the sisters were known to open their home for candlelight concerts, teas, and garden parties on behalf of the Nantucket Historical Association and other island organizations. While their home and lifestyle were a dramatic departure from the island`s conservative standards of the time, Gertrude and Hanna Monaghan are now recognized as leaders of the arts movement that remains a vibrant part of Nantucket today. In 1701 Mary Coffin Starbuck became interested in the faith of the Quakers after hearing itinerant Quaker preacher John Richardson speak before a crowd of Nantucketers. It was in her house, situated now at 10 Pine Street, that early Quaker meetings took place. In the years after 1708, the Nantucket Meeting outgrew a series of meetinghouses, the largest being the Great Meeting House on the site of the Quaker Burial Ground at the end of Main Street. Quakerism gradually became the dominant religion of Nantucket`s ruling elite and a majority of island residents during the most prosperous days of the whaling industry. It effectively served as the official faith of the small maritime community that would become the whaling capital of the world. Quakerism declined in the nineteenth century, partly as a result of its own internal divisions. The Nantucket Meeting broke into three different sects, each of which held separate meetings: the Hicksites, the Gurneyites, and the Wilburites. The Quaker (Friends) Meeting House on Fair Street was erected in 1838 and originally served as a Friends School for the Wilburite Sect.